Most people no longer witness the death of a relative at home. The Victorian scene so often described by Dickens, and still experienced in many homes throughout the 1920s, has faded from memory. 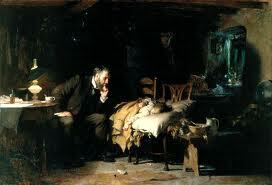 Even modern GPs seldom care for patients thought the final stage of dying. The hospital and the hospice sharing the spoils. I would say that to make yourself available to the patient and her family, where a death is to be expected, is a worthy consideration. And with the advent of mobile phones, no longer is one housebound waiting for patients to call, or expecting one's spouse to man the home phone whilst the doctor drives around with a bleep. I say this because a few months ago I gave my mobile phone number to the family of a patient of mine dying at home form advanced malignancy. I explained that they could call me any time of the night or day, but I made it clear that I might not be able to attend depending upon my circumstances. As it happened they called me about 3am on a night when I had moments earlier taken a call from my sister advising me that my mother had just been admitted as an emergency in the local hospital. Most GPs do not care for many patients dying at home each year. Give the family your mobile number. It's just a tiny bit of traditional family practice that will mean so much to the grieving family in the months and years ahead. And will cement your relationship with them throughout your career-assuming you're not going to change practice every 5 minutes.